Little Miss does the roll between the legs move. Little Man? He literally tosses the ball from a standing position. I am afraid he is going to dent the alley and we will be banned from bowling for good lol! In any case everyone has a good time. I stitched 2 pieces from the 6x6 pad onto a manila tag (inked all the edges with red chalk ink) and then added some stickers from the collection kit. The little present is popped up with Therm O Web 3D Zots. And I added another 3D Zot dipped in chunky glitter with some thin wire made to look like a Christmas tree ornament. Have you started or, ahem, finished your Holiday cards? Now that I have a Christmas collection I love, I guess I better get cracking. Hopefully I'll be able to share some next time! Until then, have a great week! wow!! these projects are amazing Rebecca!! this second layout is my fav!! way to go!! OH WOW!! These are absolutely AMAZING Rebecca!! Love this line too! You are rocking the Echo Park!! I just love he bowling layout, so much fun. My kids love to bowl, too. And your layout about Me Time is perfect. It makes me want to do a similar themed page, great idea!! Every year I say that I should make my own gift tags and I never do. 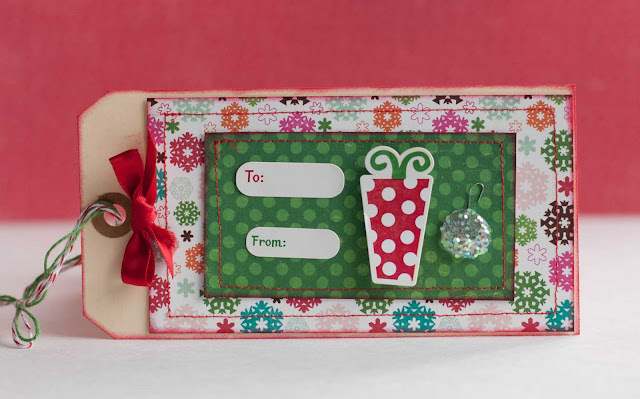 Your Christmas tag makes me want to go play with paper! ANd you sure got creative with the Happy Days collections! 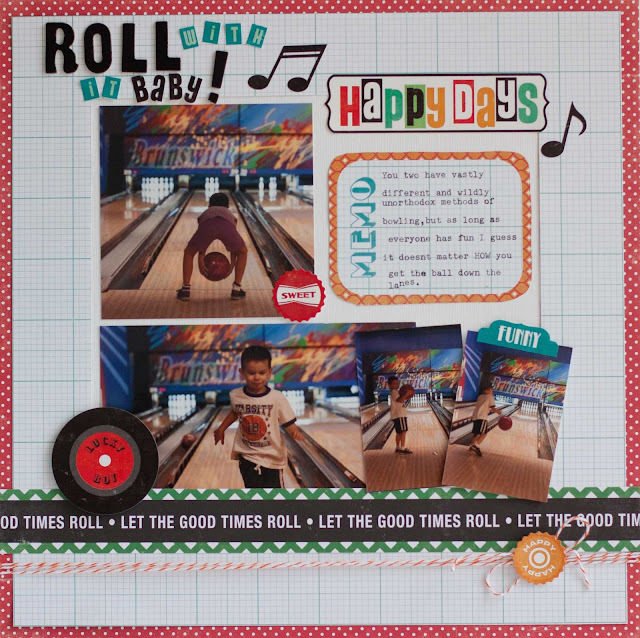 Love the pages... that bowling page rocks! These are totally cool REbecca I love thw 50's style especially in that first one! These layouts are so awesome!! 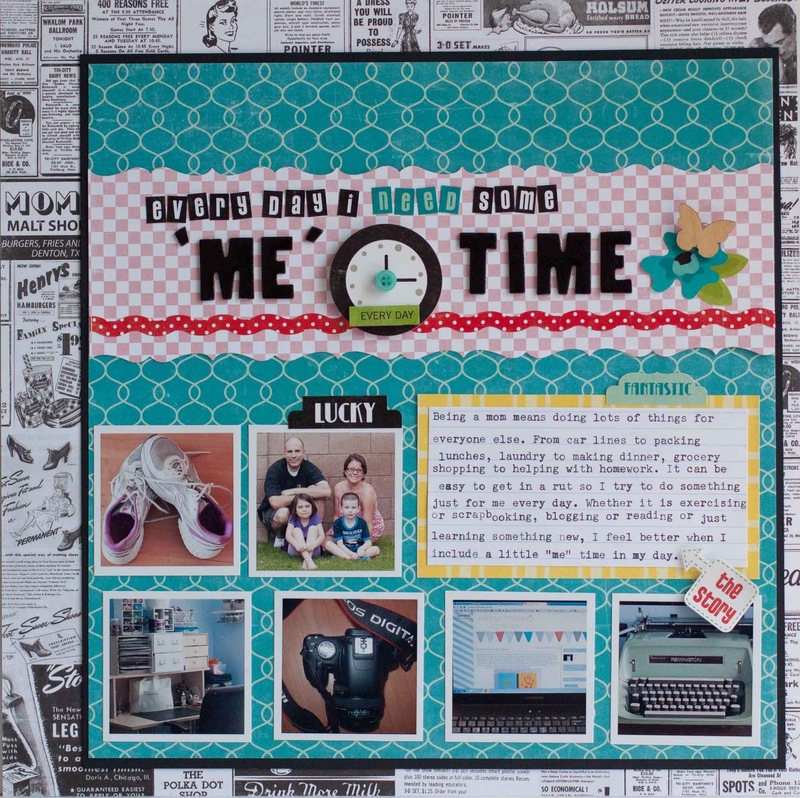 I didn't think I like the Happy Days collection until I saw your layouts! LOVE the way you did the title on the bowling layout!